Samford University awarded about 240 degrees at its fall commencement Dec. 12. 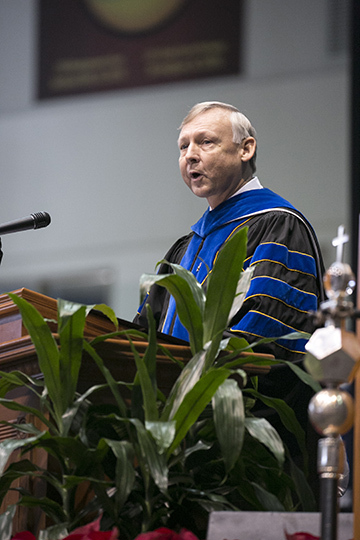 David W. Chapman, dean of Samford’s Howard College of Arts and Sciences for the past 15 years, presented the commencement address. Chapman, who has served on Samford’s faculty for 25 years, will step down as dean at the end of the current academic year, but will continue to teach as professor of English and will have a role as director of the John Howard Scholars following a sabbatical during the spring of 2016.On Friday before commencement, Howard College of Arts and Sciences honored Chapman during its end-of-semester gathering. The celebration included tributes from college faculty and staff, and the distribution of A Samford Life, a book of Chapman’s reflections on his time at the university. College, especially, is viewed as a time of great opportunity for self-discovery, but Chapman said it is only the beginning of “a lifetime occupation.” He urged graduates to never give up the quest for self and to avoid choosing careers that suppress it. “Don’t give up your life for anything less than meaningful, satisfying work that calls forth your best self,” he said.